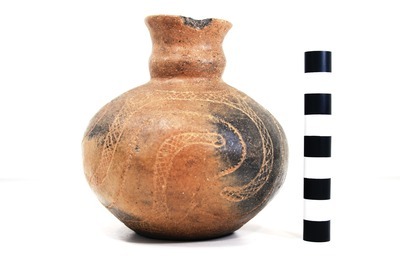 "41HS825, 2003.08.70, Burial 3, Vessel 19" by Timothy K. Perttula and Robert Z. Selden Jr.
DECORATION (INCLUDING MOTIF AND ELEMENTS WHEN APPARENT): The vessel body has an engraved meandering scroll that doubles back on itself four times. The scroll line has small engraved tick marks on it. The scroll fill zones are cross-hatched, with a series of four upper and four lower negative ovals above cross-hatched curved areas that extend towards the double-backed scroll. Hodges Engraved spool neck bottle, Burial 3, Vessel No. 19, Patton site.